A rehabilitated train station southwest of the Windsor Town Green is within 1/4 mile of the infill development site on which Vintage Oaks on the Town Green is proposed. This will provide residents with a quick and comfortable commute to their workplace once service gets underway in Windsor. The iconic Town Green, Windsor’s “downtown,” is just across the street from the infill development site on which Vintage Oaks on the Town Green is proposed – the Green will be sure to attract future residents to events ranging from the Summer Concert Series to farmers markets to Restaurant Week – all within walking distance of their new home. Aside from the expansive lawns home to the Windsor Town Green across the street, Keiser Community Park is less than a mile from the infill development site on which Vintage Oaks on the Town Green is proposed. Within a 10 minute drive are numerous regional parks, including Foothill, Shiloh, Riverfront and more – public places that provide stunning views of the Russian River, Town of Windsor and the Santa Rosa Plain. 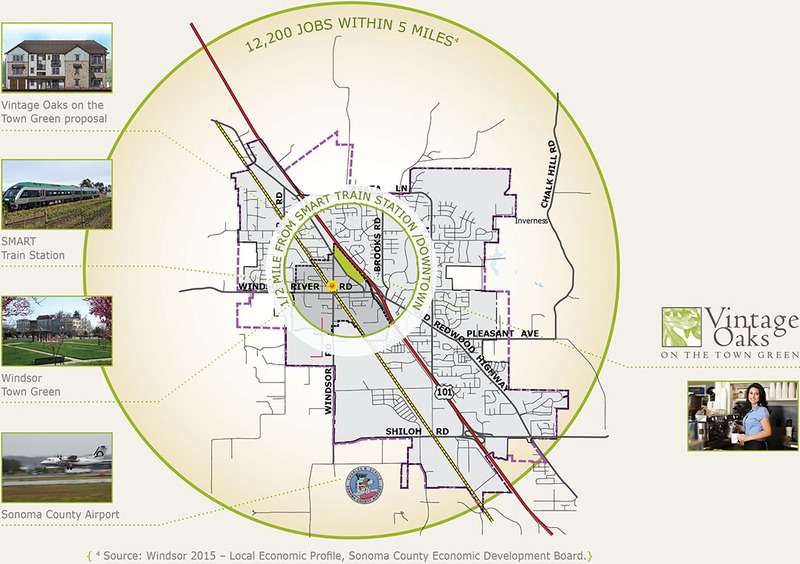 Hundreds of employers are located within a 5-mile radius of the infill development site on which Vintage Oaks on the Town Green is proposed, from wineries to corporations to the County Airport. Today, due to a lack of new housing opportunities, residents are increasingly forced to commute long distances because of the lack of affordably-priced homes. The new rental homes provided by this property on which Vintage Oaks on the Town Green is proposed will allow people to live closer to where they work, a win-win for traffic congestion and environmental quality. Infill residential development near the Windsor Town Green will provide a needed economic boost to businesses located not only in the downtown core, but businesses across Windsor. This additional housing will strengthen these local businesses, boosting our local economy and increasing consumer spending in our community. The New Bell Village Shopping Center (home to the new Oliver's Market), is located adjacent to the Vintage Oaks site and is one such example of businesses in close proximity to the project.